We know that Paul’s epistles are letters and Revelation is an apocalypse, but what exactly are the Gospels? Some scholars have claimed that the answer is easy: the Gospels are gospels. That is they are a genre of their own, created by Mark and continued on into the following centuries. The problem with this is that claiming they are a genre of their own makes their historical value rather vague as there is not much to compare with in the surrounding cultures. 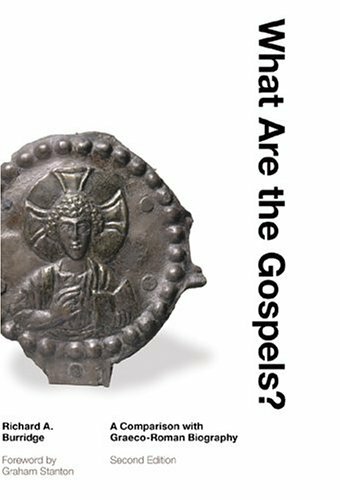 Richard Burridge, in his important book What Are the Gospels? compares the Gospels with Greco-Roman biographies and concludes that the Gospels actually fit within that genre. Critics often deny the Gospels as biographies because they do not fit the modern standards. That is foolish as they must be compared to the ancient versions. This is an excellent book that deals with genre theory and helps the reader situate the Gospels in their literary context. This book is highly recommended for anyone interested in the study of the Gospels. Thank you for the recommendation. Yes, interesting to think of these within an ancient genre. It was a very good book, well written and fantastic scholarship. Highly recommended.